Is my gas can safe? 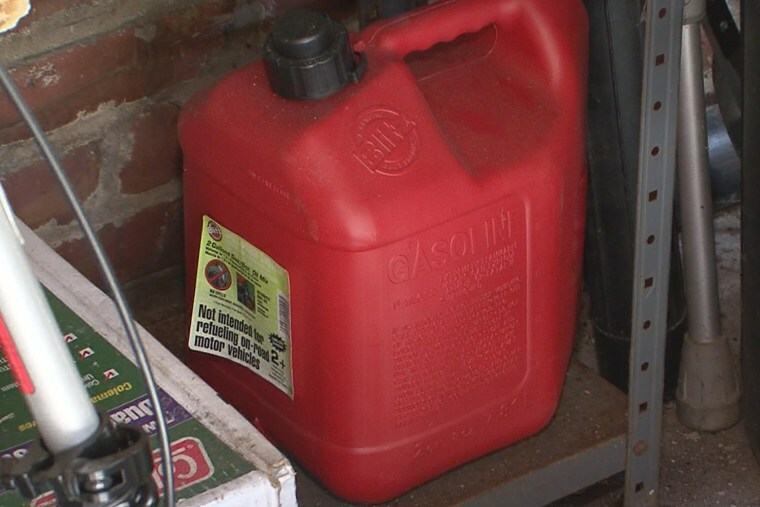 So you need to store gasoline in a portable container and you want to do it safely. What steps should you take to protect yourself and your family? First, understand the hazard – what it is and what it is not. Can my red plastic gas can explode? * Holding the can at a 42-degree pouring angle – a common angle at which consumers pour gas – with the cap off and the spout open. For an explosion to occur, gas vapor escaping the can must come in contact with a source of ignition such as a flame or spark and ignite, and the flame from the ignited vapor must travel back into the can through the spout, and the gas/air vapor mixture inside the can has to be in a concentration that falls within a defined flammability range. Will my red plastic gas can explode? The odds are very high that the gasoline vapor mixture inside your red plastic gas can will not explode. The consumer plastic gas can industry trade association, the Portable Fuel Container Manufacturers Association, estimates that there are between 120 million and 150 million plastic gas cans in circulation across the U.S., and that these cans are poured as many as 3 billion times each year, for the most part without incident. There is no available reported number of confirmed gas can explosion incidents, but there have been at least 80 separate incidents that have led to lawsuits over the past two decades. The federal government’s Consumer Product Safety Commission has counted at least 11 reported deaths since 1998 and its National Electronic Injury Surveillance System estimates approximately 1,200 emergency room visits from 1998 to 2012. The industry contends that the explosions are likely taking place outside the cans, not internally, and attribute most injuries to misuse of products by consumers. Which brands and models carry the risk? Scientific testing by Worcester Polytechnic Institute’s Department of Fire Protection engineering found that gas vapor mixtures inside all the brands it tested could explode under the limited conditions mentioned above, and testers said they believe all plastic cans share the same vulnerability. Can I buy a portable gas can with a flame arrester? Yes. While no manufacturers currently offer portable plastic gas can products with flame arresters, several manufacturers offer metal safety cans with flame arresters for sale to consumers. Should I get a portable gas can with a flame arrester? NBC News is not making any direct recommendation about whether you purchase a portable gas can with a flame arrester. We encourage you to read and watch our full reports and make your own decisions based on all the public information available. How can I minimize the risk to myself and my family members? Remember that mixing fire and gasoline is always dangerous, and that gasoline should not be poured on a fire or used to start a fire. Experts say you should not leave small amounts of gasoline in a gas can, or fill the gas can more than 95 percent full. Use a tight-fitting cap and store the gasoline at room temperature, not in heat or cold. Do not store gas in unapproved, untested containers like milk or soda bottles. Remember not to refill a gas can close to a hot engine, or pour gas into a lawnmower or other small machine when it is still warm from use. Be aware of any possible sources of ignition nearby – flame or spark, including static electricity – when you are using a gas can. You can educate yourself about the hazard and recommended precautions when handling gasoline in portable containers online. Several online resources offer consumer guidance on how to handle gasoline and portable gasoline storage containers as safely as possible. The American Burn Association offers a “Gasoline Safety Educator’s Guide,” which includes precaution tips; the American Petroleum Institute also offers a list of precautions, “Tips for Safe Storage and Disposal of Gasoline”; and the Portable Fuel Container Manufacturers Association operates a National Gasoline Safety Project, which includes a separate website called StopGasFires.org. The PFCMA asserts that portable plastic gas cans are safe, and that most burn incidents have involved consumers pouring gasoline on a fire. Its main message to consumers at www.StopGasFires.org is that “gasoline and fire never mix” and that consumers should never use gasoline as an accelerant to start or reignite or enlarge fires of any kinds.